Built during the second half of the 18th century, on the ruins of a Roman Palace, inhabited by artists of different molds, painters, musicians, composers, the sumptuous Villa Bismarck, takes its name from its most famous owner, the Countess Mona Strader Bismarck. 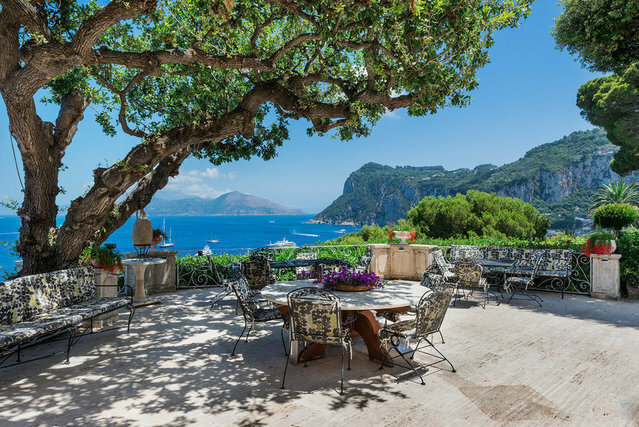 The villa, one of the most beautiful in the world, enjoys a privileged location on the island of Capri. Since the entry into the beautiful garden the eyes are satisfied thanks to a succession of frantic coasts and breathtaking views from the nearby port of Marina Grande up to the Vesuvius, the Bay of Naples and the Sorrento peninsula. Besides that the Monte Solaro and Anacapri make further amazement to the view from this extraordinary dwelling. The lush garden filled with a great variety of Mediterranean plants extends to the sea on various terraces, the first very large and panoramic one surrounds the villa, the second one contains a swimming pool with sunbathing area and through 150 steps you reach the sea. Private access to the sea, is equipped with every comfort and also has a private dock and a jacuzzi set among the rocks lying on the amazing sea of Capri. The villa dominates the surrounding area, a large and majestic living room, and a panoramic dining room with voulted ceiling of over six meters height, give importance to the sumptuous high representative area. The lovely circular library and adjoining lounge seem to evoke the history of the villa. The sleeping area is divided on several levels, on the first one there are five bedrooms with en-suite bathrooms. On the second floor with separate entrances, there are two more bedrooms with bathroom, and a huge master suite with two large panoramic windows overlooking the port and the sea and an en-suite bathroom made of precious marble. The third floor has an additional suite with a beautiful sitting area enjoying the incredible view of Monte Solaro. An external annex contains the entire service area .